Frenzied Mutterings of An Odd Duck: A clean van. I'm not sure what got into my mom this evening, but after we spent the day around the house, chatting, cooking, playing outside with the kids, I found her in my van in a cleaning frenzy. Keep in mind that my dad has always said I could raise chickens in my van due to all the crumbs and lets just face it, the all around non-existent cleaning, it was filthy!!! My mom hates a dirty vehicle and apparently it doesn't even have to be her own vehicle in order for her to clean it because she hates the mess of it so much. The kids got involved in the cleaning and much to my surprise Isaac was the most helpful. My mom and I sweetly asked my dad to take out the backseats so we could shop vac all the crumbs and wet clean some spots in the carpet. Which he did, mumbling something about crumbs and chickens under his breath. 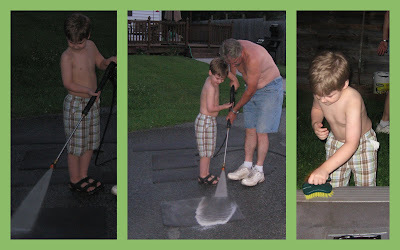 Then my dad, always ready to use the power washer, took it upon himself to clean the rugs in my van and shortly after Isaac caught sight of the water jetting out of a tiny hose, he had to get in on the action. After awhile my dad let him do it all by himself, which he loved and afterwards Isaac even decided to help with the scrubbing of the van's carpet. He was in a state of excitement the entire time, he kept going on and on about how clean the van was getting. This is what my lovely Mackenzie did the entire time. Wait, that's not true. She took a car cleaning wipe and swiped at the dashboard a few times. Oh yeah! Then she decided it would be better to clean my arm with it??? Yuck! She looks simple doesn't she...ha ha; pay back for smearing my arm with car cleaner stuff. Oh, a short PS. We no longer could raise chickens in our van. I'll have to take pictures tomorrow once all the rugs are dry and everything is put back into the van. We got the seats in but we're washing the car seat covers and waiting for the rugs to dry. I'm so excited, it's like having my van detailed on the inside. I just wish it had that new car smell too! !